While the most nourishing foods are made from unprocessed whole ingredients, busy lifestyles lead most of us to frequently resort to the convenience of pre-packaged foods. Processed food has a well-deserved reputation as the source of many of America’s dietary ills, such as excess sugar, sodium and unhealthy fats, but if you know how to read a nutrition label you can make smarter choices and avoid the worst offenders. For example, Chef Marshall’s Quick Skillet Chicken and Veggies is a recipe that uses the convenience of rotisserie chicken and optional frozen veggies to simplify meal preparation. Calories – Don’t spend them all on one food item. If your daily calorie requirement is 1600 calories (women) or 2000 calories (men), eating a single food item that contains 800-900 calories per serving, often found in restaurant meals and pre-packaged frozen foods, means it will be very hard to stay within your daily calorie limit. Serving Size – Adjust nutritional values to reflect the amount you will actually eat. 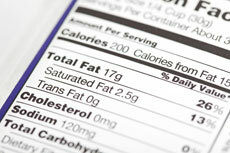 Nutrition values on a nutrition label are calculated based on the amount of food in the listed serving size. Some serving sizes are unrealistically small, leading consumers to believe they are eating fewer calories than they actually are. Consider how big a portion you will eat and adjust the nutritional values accordingly. Sugar – Minimize sugar, whether added or naturally occurring. Unlike the naturally occurring sugar found in foods such as fruit, added sugars are added at some point during processing. Try to avoid foods that contain more than 10 grams of sugar per serving and strive for foods with only 5 grams. Some newer nutrition labels specifically list added sugar; otherwise, look for grams of sugar under total carbohydrates and search the ingredients list for added sources of sugar, such as sucrose, glucose, high fructose corn syrup, corn syrup, fructose or many others. Fiber – Choose foods with at least 3 grams of fiber per serving. Choose foods that are naturally high in fiber from whole grains, legumes and vegetables and try to avoid foods that contain supplements to increase fiber content. Sodium – Look for less than 450mg of sodium per serving. Much of the excess sodium in Americans’ diets comes not from the salt shaker, but from processed and restaurant food. Keep your sodium intake below the recommended limit of 2,300 mg daily by choosing pre-packaged foods containing less than 450 mg sodium per serving and strive for 350 mg per serving. Fat – Don’t avoid fat: choose the right kinds. Healthy fats – like those found in olive oil, nuts and avocados –help you absorb important nutrients, keep you from feeling hungry and make food taste better. Limit saturated fats to 10 percent of daily calories and avoid any food that contains even a small amount of trans fat. Skip pre-packaged foods that are low-fat or no-fat – these foods are usually higher in sugar to compensate for lost flavor. You feel your best when the bulk of your diet is comprised of whole foods, but you can enjoy the convenience of more nourishing pre-packaged foods by checking these seven important items on the nutrition label before you choose. When you know what to look for on a nutrition label, you can make quick, smart decisions about which foods will help sustain your energy and improve mental clarity – and which you should leave on the shelf.